For more articles on the Fairweather please use the menu on the right. Extra house space can come back to haunt you, when you realise all those extra rooms and space can lie idle for up to 90 per cent of the time. So builder Sarah Homes sensibly scales the middle ground in offering flexible entertaining and living space - inside and out - with its traditional three-bedroom design, the Fairweather 3e. "This home suits a variety of people," says Helen Lowrie of the Longridge Group. "It can suit either a family where the parents can be zoned away from the kids, or it can suit people who often have guests to stay but don't want an overly large home." It will also be a good fit naturally for people downsizing their living arrangements. The 11.2m wide design suits a standard block shape, so it will appeal to the home buyer who also prefers a more traditionally designed home or who is after a holiday home. And Helen says that has been underlined by positioning the formal lounge at the front of the Fairweather's layout, adjacent to the main bedroom. With 136sqm of living space alone, the Fairweather 3e lets you breathe comfortably whether relaxing or hosting a gathering in its open, central living/dining hub. "The kitchen is located centrally, which suits our relaxed Australian lifestyle where the kitchen is the hub of the home," Helen says. "It offers direct access to the dining area, which is positioned to the side, as well as the family room which it overlooks." The dining and family living zones open directly out to the entertaining decks, arguably one of the Fairweather's crowning glories. "The deck area features an alcove that can house a barbecue, which can either be built in or be freestanding," Helen says. "The deck has a large section under the main roof, which is good for those hot summer days." So it's easy to picture having breakfast or a quiet drink alfresco style there most of the year. The open plan, central living and dining hub covers about 44sqm and will encourage fluid drift between the three. The space is accentuated by 2.7m high ceilings in the display version at Pooraka. Dressed in neutral tones with fresh warm whites, the home feels both airy, light and calming. And the kitchen zone is made even more inviting for casual meals and conversations with its island bench/bar enabling you to sit and enjoy your down time. The main bedroom offers a generous environment, covering 15.4sqm plus walk-in robe and ensuite bathroom, to make it a true haven. The second bathroom is set closer to the two secondary bedrooms, one decorated as a little girl's dream room, and underlines the flexibility of this layout. 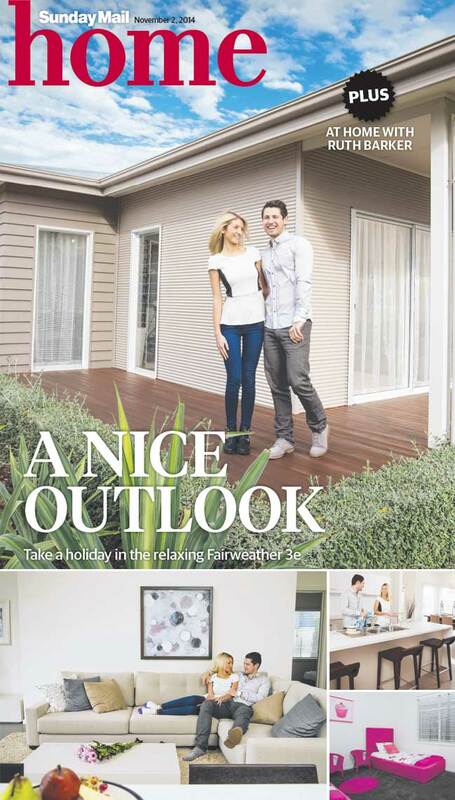 The Fairweather's thoroughly modern image is enhanced by its cladded exterior, featuring a weatherboard profile known as James Hardie's Linea and a modern, low sheen, Solver paint finish. It's a design you can easily imagine as a holiday home at the beach or as a rural retreat - and is one to enjoy. For more information about the house in this story please look at the Fairweather 3e.